When the most eligible Earl of Rule offers for the hand of the Beauty of the Winwood Family, he has no notion of the distress he causes his intended. Miss Lizzie Winwood is promised to the impoverished Edward Heron but the Earl of Rule wants her as his wife. Lizzie’s sister Horatia conceives a dazzling plan to avert a nuptial disaster, and offers herself instead. When Horatia married the powerful Earl of Rule, she was only saving her sister from a loveless match, rescuing her family fortune, and providing herself with a life of ease. Hers was a marriage made not in heaven but in the coolly logical mind of a very self-possessed young lady. Everyone knows she’s no beauty, but she’ll do her best to keep out of the Earl’s way and make him a good wife. The Earl of Rule has found just the wife he wants, unbeknownst to Horatia, the Earl is enchanted by her. There’s simply no way he’s going to let her get into trouble. Overcoming some misguided help from Horatia’s harebrained brother and a hired highwayman, the Earl routs his old enemy, and wins over his young wife, gifting her with a love that she never thought she could expect. Georgette Heyer’s books may be something of an acquired taste. I know a bunch of readers and bloggers who are absolutely devoted to her works. As for me, I tried her books for the first time just last year, and found them awfully fun, if a bit overly obsessed with fashion, hair styles, and all things upper class. 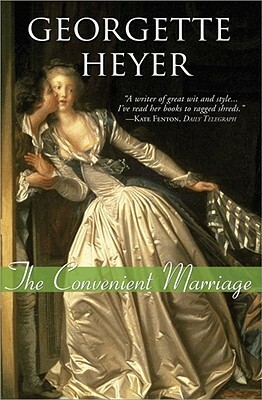 The Convenient Marriage is an intensely silly book, in which the headstrong 17-year-old Horatia decides to pursue a marriage of convenience with the much older Earl of Rule, sparing her older sister the obligation of marrying someone she doesn’t love in order to rescue her respectable family from their brother’s gambling debts. Rule appears initially amused by Horatia’s boldness, and basically takes a “why not?” approach to trading sisters. Horatia vows to keep out of Rule’s way, enabling the handsome, desirable rake to continue carrying on with his mistress. Things become complicated when Horatia becomes the talk of the town, and even more complicated when the Earl’s old enemy decides to take revenge on him by ruining his wife. Of course, nothing goes according to plan. The most entertaining portions of the story have to do with Horatia’s brother’s madcap schemes to save her reputation and punish the wrong-doers — his antics are silly, drunken escapades that are totally ridiculous yet also terrifically funny. The Convenient Marriage doesn’t offer much in the way of character depth — both Horatia and Rule’s inner lives and motivations remain murky throughout — but it’s a lot of fun, and worth reading for the social manipulations and games (as well as the descriptions of the truly outrageous hairstyles and diamond-encrusted shoes).